The Fairchild AC-119G Shadow and AC-119K Stinger were developed during the Vietnam War. They replaced the inadequate AC-47 Spooky and supplemented the newer AC-130. Contrary to popular belief, the AC-119 program (Project Gunship III) came after the AC-130, not before. By late 1967, the idea of the fixed-wing gunship had been proven so successful that the United States Air Force was having a difficult time keeping up with demand. The newer AC-130s that had been created under Project Gunship II were effective, but were being mostly used for interdiction of the Ho Chi Minh Trail. Furthermore, the C-130 airframe was in active service as a transport, vital to the war effort in South East Asia. The Air Force desperately needed a new gunship to replace the vulnerable and underpowered AC-47 in supporting "Troops In Contact" (known as TIC), as well as, supplementing the AC-130 in attacking targets on the Ho Chi Minh Trail. The C-119 Flying Boxcar presented an obvious choice, having been phased out of frontline service in favor of the C-123 and C-130, and with the stock of available airframes in U.S. Air Force Reserve being great. In February 1968, under the USAF program Project Gunship III, 26 C-119Gs were converted to AC-119G standard, taking on the name Shadow. These aircraft were primarily intended to replace the AC-47 in the TIC role. In addition, Fairchild-Hiller, which was contracted for all the conversions, converted 26 C-119Ks into AC-119Ks primarily for the "truck hunter" role over the Ho Chi Minh Trail. These aircraft were called Stingers primarily in reference to the two M61 20 mm cannons they carried in addition to the AC-119G's four GAU-2/A miniguns. By November 1968, the aircraft had deployed to Vietnam and joined the 14th Special Operations Wing at Nha Trang. The AC-119Gs were formed into the 17th Special Operations Squadron, and the AC-119Ks into the 18th Special Operations Squadron. With the addition of the two types the 14th SOW for a time in 1968 was flying eight different aircraft from 10 different bases in South Vietnam. The 14th SOW was deactivated in 1971. 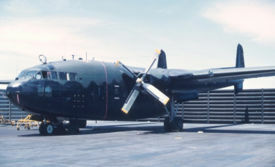 Limited numbers continued to be operated out of Hurlburt Field, Florida as late as the fall of 1972, but the AC-119 was shortly phased out of the U.S. Air Force. The AC-119G and -K continued to serve in extremely small numbers with the Republic of Vietnam Air Force (RVNAF) until the defacto reunification of the country in 1975. Project Gunship III, being a follow on to the success programs surrounding the AC-130 series, meant that the AC-119 was a far more advanced aircraft in both its iterations than the AC-47. Even the TIC AC-119G featured some of the most up to date ECM and radar equipment, as well as cruder technology including an AVQ-8 Xenon light, a Night Observation Sight (NOS), and a LAU-74/A flare launcher. The AC-119K, designed to hit trucks on the Ho Chi Minh Trail was significantly more advanced. Included in the conversion was the AN/APN-147 Doppler Navigation radar, AN/AAD-4 Forward Looking Infrared (FLIR), AN/APQ-133 side-looking beacon tracking radar, and AN/APQ-136 search radar. The armament scheme for both aircraft was significantly simpler than that of the AC-130. The AC-119G had a total of 4 GAU-2A/A miniguns in SUU-11A/A pods, all on mounts similar to those used on early AC-47s. Like late model AC-47s, these were soon changed to the purpose built MXU-470/A minigun modules. The AC-119K, needing a more powerful and longer range punch to take out vehicles, featured 2 M61 20 mm cannons in addition to the 4 Miniguns of the AC-119G. Petrie, Bill (2006-01-12). AC-119G Shadow. USAF AC-119 Gunships. AC-119 Gunship Association. Retrieved on 2005-04-18. Petrie, Bill (2006-02-27). AC-119K Stinger. USAF AC-119 Gunships. AC-119 Gunship Association. Retrieved on 2005-04-18. This page was last edited on 6 March 2007, at 07:55.